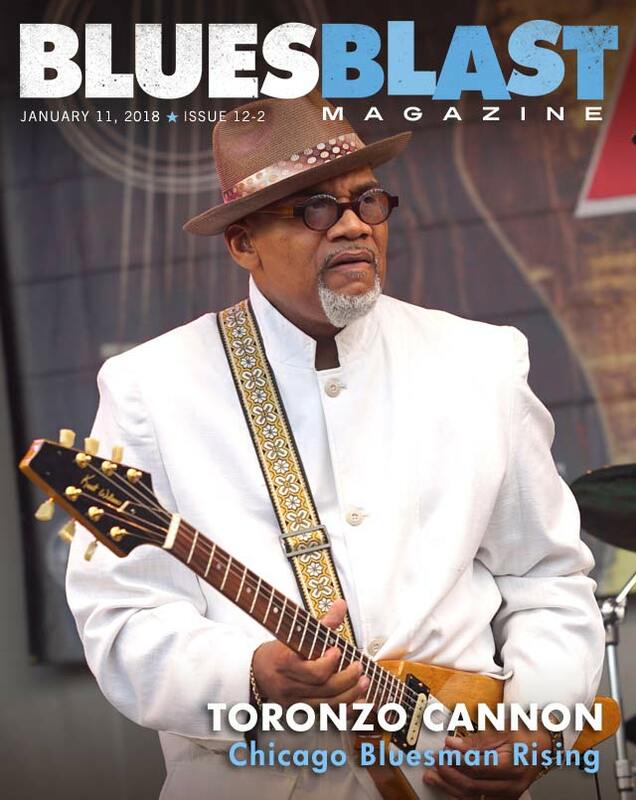 When I contacted Toronzo Cannon to set up an appointment for a phoner for Blues Blast, his masterful storytelling chops kicked in and quickly gave me the talking Blues. He regaled me right out of my logical mind. Somehow he convinced me out of the gate that he was present at Chuck Berry’s infamous 1959 Mann Act arrest! At some point I remembered seeing Chuck Berry live when I was about sixteen. Berry was about forty then. I was nine in 1959 and am almost twenty years older than Toronzo. After an embarrassing laugh, the chronological facts finally in perspective, The Chicago Bluesman broke down the serious side of his story. Mr. Cannon really considers storytelling the foremost facet of his Blues arsenal. 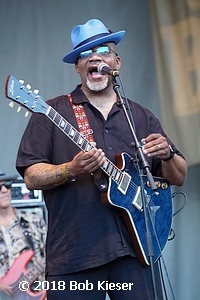 He actually downplays his guitar playing and describes himself as a story driven Bluesman. He was born and raised in Chicago under the strict tutelage of his grandparents, Linch and Earthy Lee Cannon. His grandfather Linch, bestowed upon him the name Toronzo and imbued upon him a healthy respect for the straight and narrow. “I would’ve rather felt the wrath of the Blackstone Rangers than that of my grandfather. He and grandmother brought me up. He was from Jackson, Mississippi and she was from Memphis, Tennessee. They wasn’t takin’ no mess. All I needed was one whuppin’ from that razor strap. But, I got two in my life, know what I mean? That first one should’ve done me right, but then I went and stayed on the basketball court from noon until past nine at night one Saturday. Life before music was for young Toronzo was filled with hoop dreams. By his late teens Earthy Lee Cannon had Toronzo in church. I was compelled to ask The Chicago Bluesman if he ever saw evidence of the Holy Ghost in church. “Oh yeah. Quiet as kept, I caught it one time. I’ll just put it this way. The spirit is real. I was sitting in church one day and the Pastor was hittin’ all these points that were goin on in my life at the time. He was hittin’ ’em hard. Suddenly I started feelin’ a little cold. My body started shakin’ a little and I started cryin’ out of both eyes. The next thing I knew the ushers were all around me. I didn’t fall out, I wasn’t slain in the spirit. All I can say is that’s why I don’t play with God. I can talk crazy and a little slick but I do not play with God. I see cats try to be slick and use God Bless You as the new F you these days. I get it on the bus all the time. I have to let it be known that I joke but don’t play. Toronzo’s church experience psychically scorched him just enough to be pulled in the orbit of the the guitar. It might’ve been DNA. When lauded for his own playing, he almost refuses to believe that his chops are anywhere near the cream. Obviously, his self concept is that he is a better lyricist than guitar player. When I compared him to Eric Gales, his response was, “Aww, come on Bruh… Eric is a monster. I’ll take the compliment but the way I feel is that if I can’t sell the fruit, then I can sell the vegetables. You know, there’s another Chicago Blues elder named Sammy Fender who told me years ago, ‘Don’t you ever deflect a compliment.’ So, I’m not tryin’ to do the whole modest thing. I’m really flattered that you would say something like that man, because, you know, I don’t hear what other people hear. And I’m always nervous and kinda insecure about my guitar ability. It’s part of what keeps me driving the bus. I’m on that bus everyday thinkin’ about how I can advance my music career. I need a plan B. That comes from my grandfather. As far as my stage show and how I present my music, I’m very confident in that and I wish I was as confident in my guitar playing when I present it to the people. I’ve always been insecure about my guitar playin’ man, even though sometimes, I can get in the zone, freak out and feel good about what I’m doin’. Lately, I’ve been messin’ with the acoustic and slide to present more diversity in my playin’ and songwritin’. Part of it is to let cats know, yeah, I can do this too. Also to let my stories shine without a lot of guitar behind them. So even though I’ve been out here for awhile, as recently as my last couple of East Coast swings through New York and Pennsylvania, I met fans who say they never knew about me until they saw me play. That’s kinda good when you’re playin’ a festival when people say, ‘Wow, he was energetic, he was freakin’ out, he was doin’ his thang better than the headliner. That kinda makes you feel good. 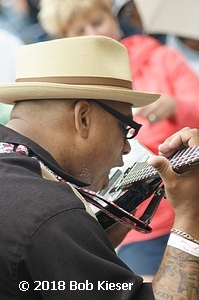 I don’t know if it’s a Chicago thang or not, but I was taught by different musicians in Chicago that if you are playing under the headliner, you are supposed to light that headliner up – make that headliner work. 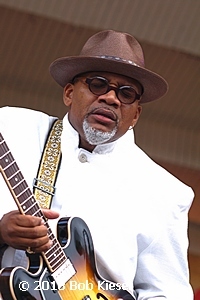 When I opened up for Otis Rush, I clammed up because, you know, it was Otis Rush. My band was relatively new. I hadn’t quite grasped the concept of eating up a headliner. The awe of opening up for him – He’s left handed, I’m left handed. I wasn’t a punk about it. I didn’t go out there suckin’ my thumb, not makin’ eye contact. I did my thang but not the way I’m capable of. I was like, wow, that sounds crazy but I guess in the passion of my wanting to please everybody with my music, when you see that one dude in the audience with that smirk on his face, it’s like, dang, I’m movin’ everybody but this dude right here, but you know, maybe his face is like that because he has a corn or a bunion. Maybe I should concentrate on playin’. Getting back to that Mike Wheeler quote, he actually told me that years ago. We were on a plane with Chico Banks going to do a gig in San Jose, California. Chico Banks was a local Chicago guy who was like the Michael Jordan of the Blues scene. He passed away in 2008. This was before I signed my first deal with Delmark. I was just happy to be with these two guys because they were my local heroes. Mike Wheeler was one of the first musicians to phone me without going Hollywood on me. Cuz, when I was new on the scene, I’d meet cats and they’d say, ‘Yeah man, we gon’ get together and do something, what’s your phone number?’ And then, never call. Mike was the guy who actually called. From that day he has been my best friend. I’d give him the keys to my house. I kid with him and my other friend Al Spears, telling them that when I die, they will be my two pall bearers. I might make it easy on them and get cremated, but so far, they are the only ones that can carry me to my grave. They’re cool like that. It’s good to have people like that who will pull you to the side and say, ‘Hey man, you foul,’ when you want to get down with someone, they’ll calm you down. I’m not a violent dude, but there’s been a couple of cats I’ve been wanting to get (down) with. Sometimes you have to let people know, man. But my friends pulled my coattail. It was like, ‘Dude, you got too much to lose. As soon as you knock that stud in his face, that’s it. Again, I’m not a violent guy, but some things are hard to take. As funny as it may seem, some people in the business tend to hate on me because I still have my bus drivin’ job. That somehow I’m not real enough for holding on to my day job. But it’s like I told the anonymous club owner that called himself blackballin’ me for a year. ‘You know, if I smash my guitar in the street today, tomorrow my bills will still be paid. I don’t have to beg anybody. My grandfather would come back in a dream and haunt me if I did. Furthermore, I’ve never used anybody to get what I got and I’m proud and confident of that. Cuz I sit back and I see what cat’s do to make it. And if that’s their method of making it, handle your business, do your thang. But don’t look at me, don’t trip on me cuz I have a regular job. “Oh he’s a weekend warrior, he’s gotta job.’ Dude, ain’t none of this promised. Music ain’t promised. Job ain’t promised. So I’m not gonna let you sit back and throw stones at me because I have a plan B. You jumped in full force and now you have a tooth missin’, can’t pay your bills and have a different cell phone number every six months. I don’t live like that at this stage of my life. I see it for what it is. I don’t do anything to anybody. I don’t hang out. You’re not going to see me as a permanent fixture in the club cuz I’m tryin’ to get my little six and seven hours of sleep so I can go to work. I let people be who they are going to be and don’t like snakes around me anyway. Consequently, I’ve lost a couple of band members. Now if I was twenty or so it could be different, but at this stage, that’s how I get cats off me. Having asked about the Holy Ghost in Toronzo’s church experience, I flip it and ask about how the Spirit hits when he plays the Blues. “I tell people all the time that there is a spirit in music, regardless of the genre. Sometimes driving the bus I have conversations with youngsters about it. I ask them if there has ever been a song or rap that gives them chills or any physical reaction like the hair standing up on their body. When they say yeah I point out that this happens though nothing actually physically touched them. When they hear this for the first time it gives them that forest for the trees moment. It happened to me when I heard Jimi Hendrix do “Machine Gun”. Dude! The spirit and passion of it brings water to your eyes. When I heard it, I knew why Miles Davis said, ‘That muthafuckin’ “Machine Gun”,’ when asked what song put Jimi on his radar the most. In the early ’90s when I was walkin’ around with my little acoustic in public, people would say, ‘Man, you play like Jimi.’ I swear before Lord, I had never heard of Jimi. Before that I was totally into basketball, a whole different world. So I had to do the research. I got a video tape of Monterey. Oh my word, if a Black man can clutch his pearls, I was holding my chest like an elderly White woman in England. Oh my God, this visual and the audio/audible freaked me out. So from that point forward I ran around looking for stuff on Jimi. Anything on Jimi. I did a European Blues Cruise with the great Vasti Jackson. It was like the second one ever. My band was backin’ him. He is a wealth of musical knowledge. I can sit at that man’s feet like an eight year old kid and just listen to him. He broke down to me my guitar insecurity thing. He asked me, ‘How long you been playing?’ At that time it had been about twelve years. He said, well musically you’re twelve. Some guy gave him an acoustic guitar to try out during the set, so he told the band to drop out. Then he told the crowd he was going to ask the ancestors to help out with the song. Dude, when he said that, it brought back to me what the Blues is all about; slave ships, cotton fields, segregation and all its entrapments, forbidden eye contact with the dominant culture. It brought tears to my eyes. It hit me dead in my chest. I don’t think the average person playing the Blues today gives much thought to the ancestors. I love the hell out of Elmore James, Robert Johnson, J.B. Hutto, Hound Dog Taylor, Son House and Bukka White. Cats that can wail, sing with their mouths wide open. Field holler type musicians and I know I’m missin’ some. 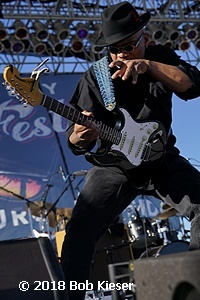 Toronzo Cannon is slated to open for Buddy Guy at Legends on Thursday January 11, 2018. His star is late blooming perhaps, yet rapidly expanding and rising.